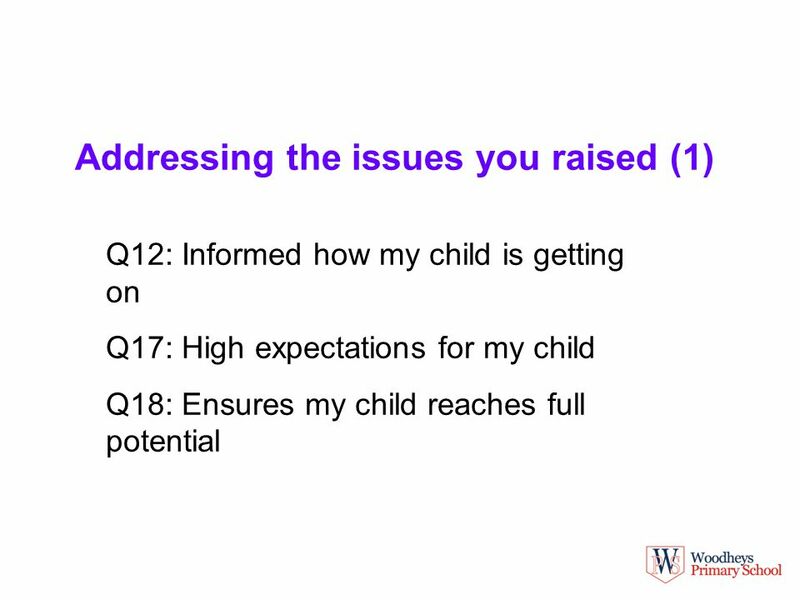 Addressing the issues you raised (1) Q12: Informed how my child is getting on Q17: High expectations for my child Q18: Ensures my child reaches full potential. 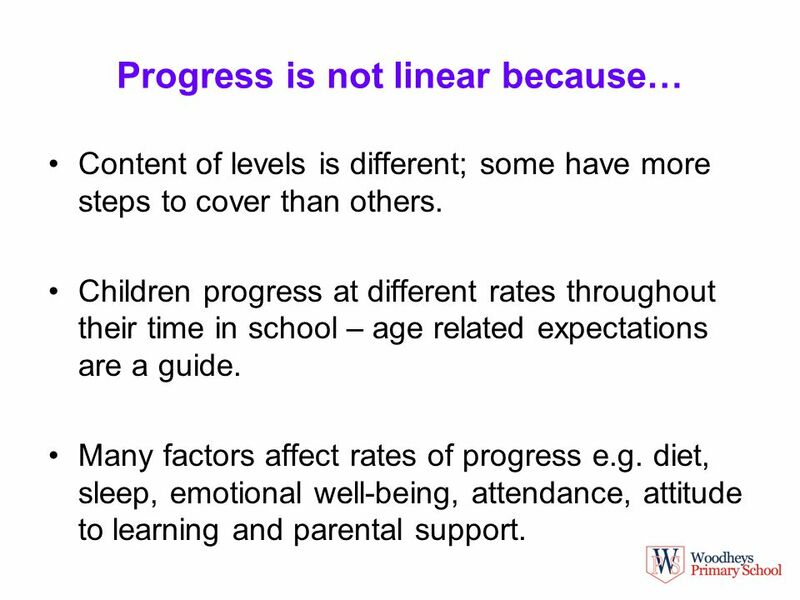 11 Progress is not linear because… Content of levels is different; some have more steps to cover than others. 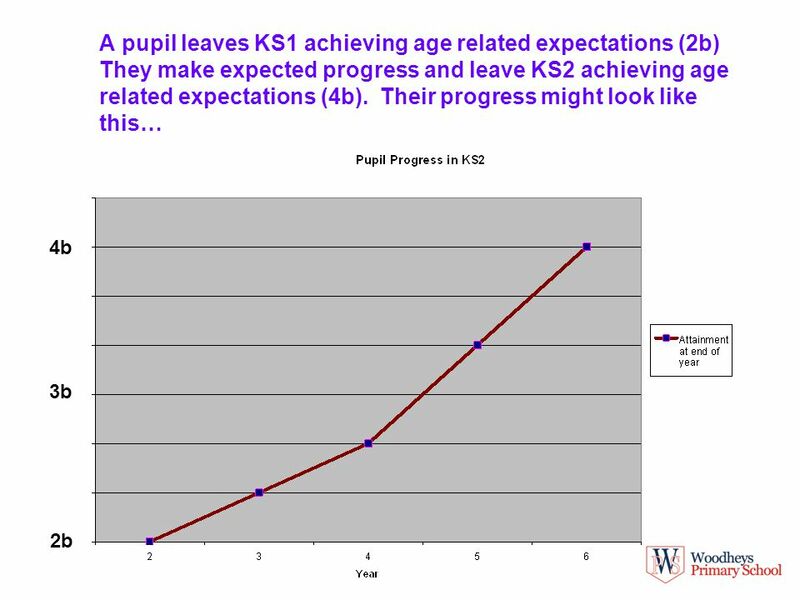 Children progress at different rates throughout their time in school – age related expectations are a guide. 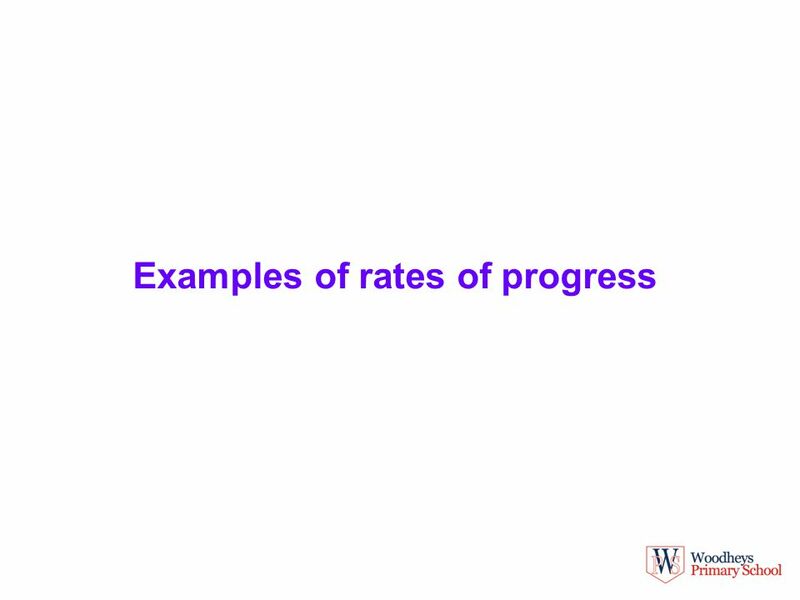 Many factors affect rates of progress e.g. diet, sleep, emotional well-being, attendance, attitude to learning and parental support. 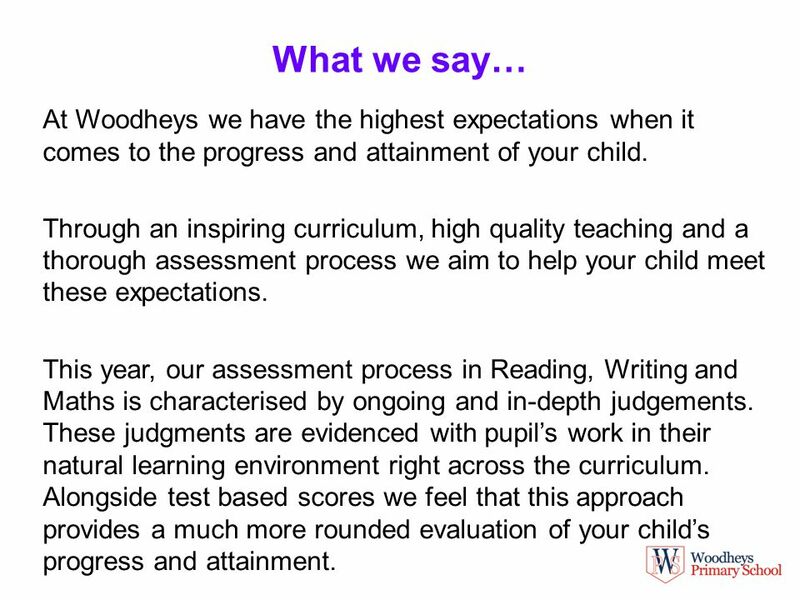 12 What we say… At Woodheys we have the highest expectations when it comes to the progress and attainment of your child. Through an inspiring curriculum, high quality teaching and a thorough assessment process we aim to help your child meet these expectations. 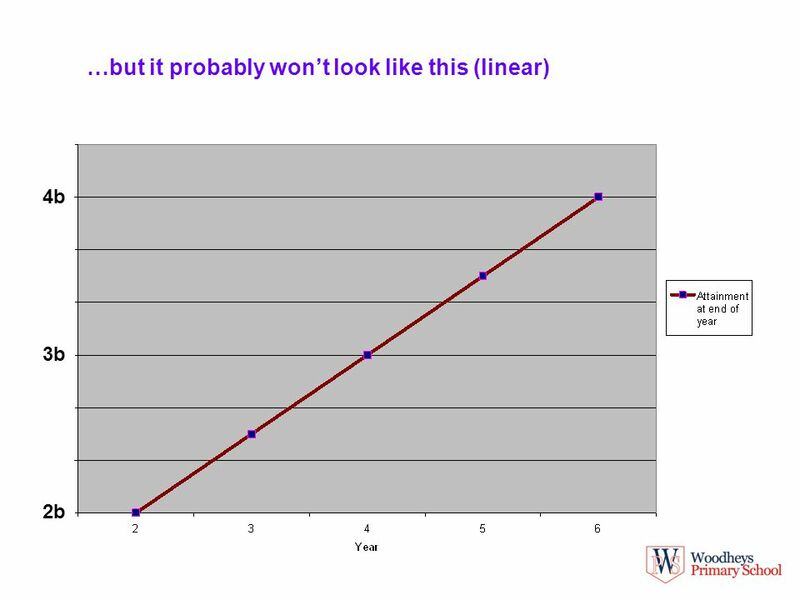 This year, our assessment process in Reading, Writing and Maths is characterised by ongoing and in-depth judgements. These judgments are evidenced with pupil’s work in their natural learning environment right across the curriculum. Alongside test based scores we feel that this approach provides a much more rounded evaluation of your child’s progress and attainment. 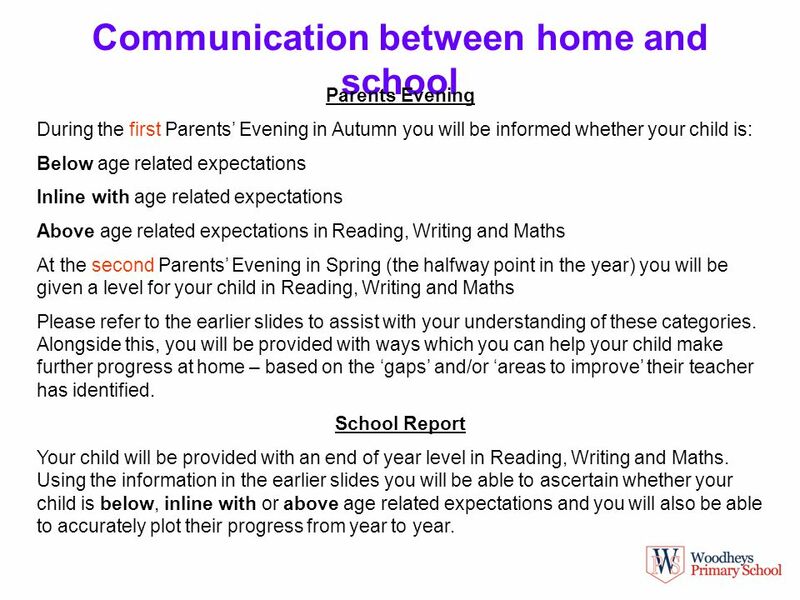 13 Communication between home and school Parents Evening During the first Parents’ Evening in Autumn you will be informed whether your child is: Below age related expectations Inline with age related expectations Above age related expectations in Reading, Writing and Maths At the second Parents’ Evening in Spring (the halfway point in the year) you will be given a level for your child in Reading, Writing and Maths Please refer to the earlier slides to assist with your understanding of these categories. Alongside this, you will be provided with ways which you can help your child make further progress at home – based on the ‘gaps’ and/or ‘areas to improve’ their teacher has identified. School Report Your child will be provided with an end of year level in Reading, Writing and Maths. 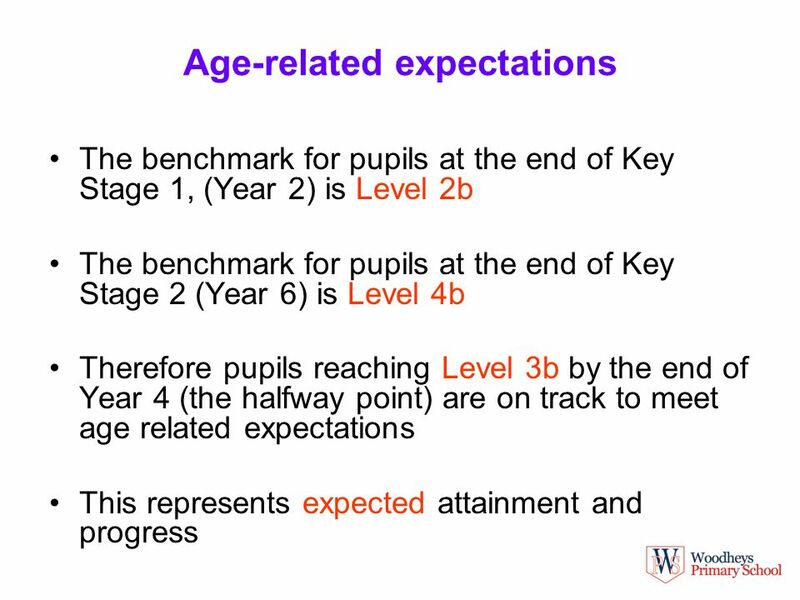 Using the information in the earlier slides you will be able to ascertain whether your child is below, inline with or above age related expectations and you will also be able to accurately plot their progress from year to year. Download ppt "Addressing the issues you raised (1) Q12: Informed how my child is getting on Q17: High expectations for my child Q18: Ensures my child reaches full potential." 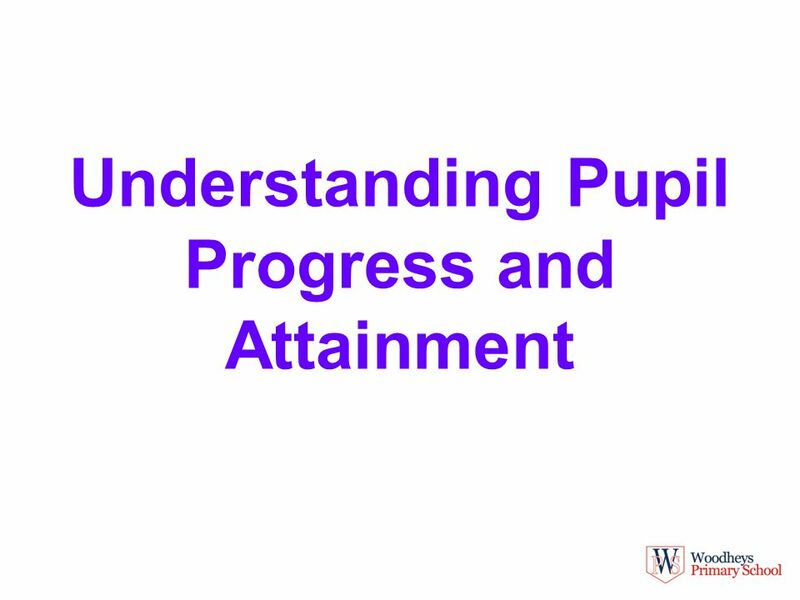 Understanding Pupil Progress Information for parents. 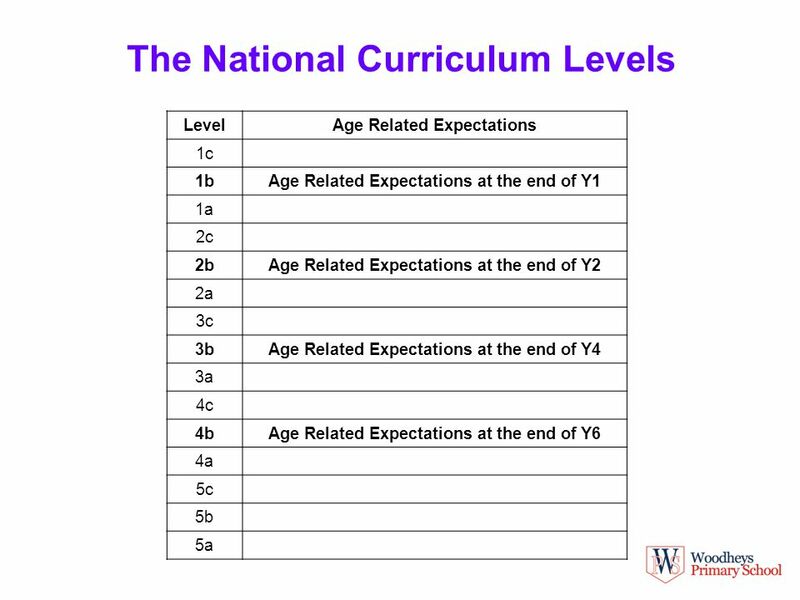 DD Assessment without levels this way… Dominic Martin Deputy Head Teacher Rebecca McVittie Head of English. Middleton Parish Church School KS1 SAT Meeting Parent’s Information Morning Wednesday 14 th November 2012 N. Dennis 2012.  Objective 1: To inform parents about changes to the curriculum and assessment procedures  Objective 2: To inform parents about the tracking of assessment. 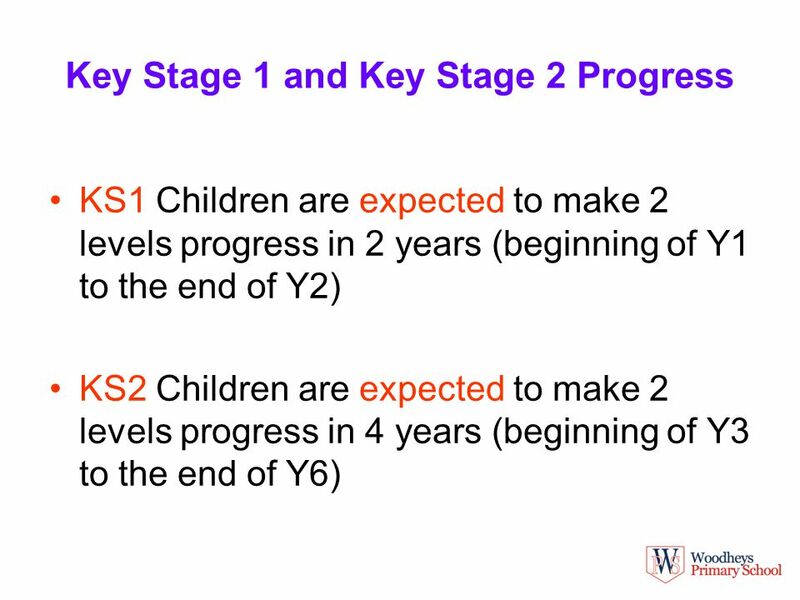 End of Key Stage One Assessments / SATs 1. 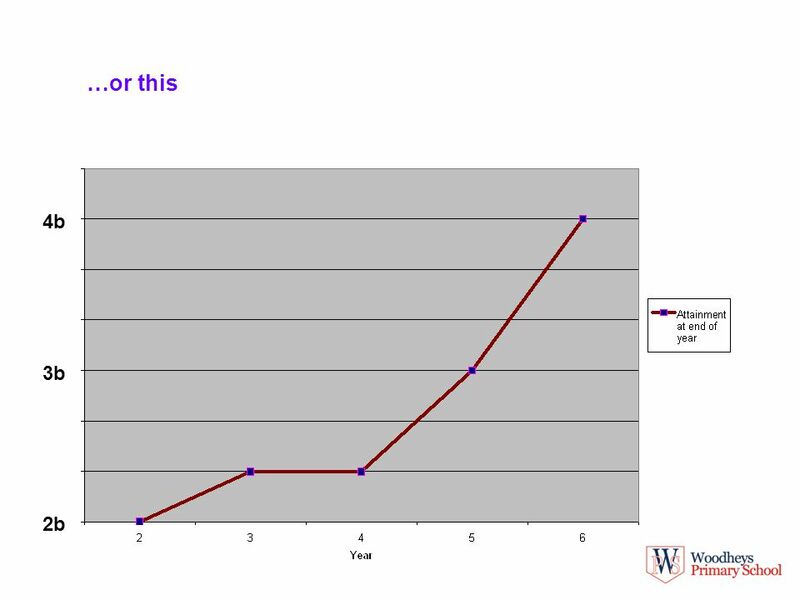 SATs at KS1 SATs stands for ‘Standard Assessment Tasks’. They are provided by the Department of Education. 1 Familiarisation with Springboard Programmes. 2 Objectives  To raise awareness of the Springboard programmes  To discuss the selection of pupils who.